The old saw is “a stitch in time saves nine”. On April 2, Ethiopia installedAbiy Ahmed as its new prime minister. The question is whether PM Abiy could save Ethiopia’s nine regions from being unstitched in civil strife. The dire predictions of Ethiopia’s implosion originate in the massive protests that began in Ethiopia’s largest region, Oromia, in 2015 over a proposed expansion of the capital’s municipal boundary through a Development Master Plan. The ruling regime cracked down heavily on protesters, resulting in the deaths of hundreds of people and thousands of injuries and arrests, according to Human Rights Watch. In August 2016, the protests spread to the second largest Amhara region which the regime sought to brutally suppress. Abiy Ahmed is the youngest African leader at age 41. He has nearly two decades of military service and is the first Oromo politician to become Ethiopia’s prime minister since 1991. Abiy’s selection as PM is said to be highly contested. He was the dark horse in the race and other party stalwarts were touted to take over the PM’s job. He extended an olive branch to the Eritrean government to resolve differences, to which the Eritrean government responded by demanding Ethiopia’s withdrawal “from the occupied territories”. The speech was well received among the general population, opposition groups and the international community. The U.S. Embassy issuedstatement expressing support and urging the “lifting of the State of Emergency”. It is not clear if this month’s scheduled vote on H.R. 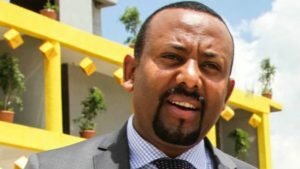 128, a resolution denouncing human rights abuses in Ethiopia, will take place given PM Abiy’s appointment. Expressions of support also came from the African Union and other African leaders. Various Ethiopian opposition leaders also expressed support butcautioned “words need to change to deeds”. The agenda the PM articulated reflects the needs, demands and aspirations of Ethiopia’s youth, which represent 71 percent of the population. He has his finger on the youth pulse and feels the rising tide of anger and frustration spreading among the youth from repeatedly dashed hopes and expectations. He knows he became PM because of the sacrifices, mobilization, agitation and support of the youth. Surely, he is aware that the youth seek regime change and will not tolerate a game of regime musical chairs. Failure of civil peace under PM Abiy’s leadership means an all-out civil war in Ethiopia. I believe the youth are PM Abiy’s insurance policy for success. They are increasingly becoming skilled and effective in the use of mass civil disobedience and peaceful resistance in demanding change. In March, the youth managed to implement a week-long fuel blockade across the country to pressure the regime. The elephant in the room is the Tigrean People’s Liberation Front (TPLF), one of the coalition partners in the ruling regime. The TPLF presently dominates the military, the security forces, the economy, and the bureaucracy. According to Global Security, the TPLF has set up its own private mercenary paramilitary group whose “purpose of existence is to ensure the regimes hold on power remains unchallenged.” and “accountable only to a select few senior echelon members of the TPLF.” Others have testified before Congress on the role of the special paramilitary group in committing torture, abuse and extrajudicial killings. Alemayehu (Al) Mariam is a professor of political science at California State University, San Bernardino, with research interests in African law and human rights. He is a constitutional lawyer and senior editor of the International Journal of Ethiopian Studies.